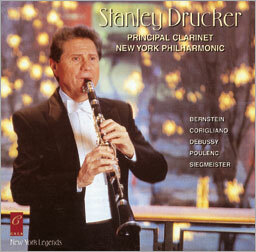 The third disc in the Cala series featuring principals from the New York Philharmonic showcases Principal Clarinet Stanley Drucker. Joining the orchestra at 19, he served for over 50 years, during which time he was named Musical America's Instrumentalist of the Year, and is one of the few living orchestral musicians whose biography appears in New Grove. Here he presents a fascinating cross-section of solo clarinet repertoire.